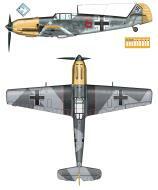 Profile 00: Messerschmitt Bf 109E-7 flown by Hptm. Gunther Scholz, Kommandeur of III./JG5, Petsamo, Finland, 1942 Instead of the normal 74/75/02 mottle, the uppersurface camouflage on this aircraft is believed to have been oversprayed completely in a rather simple scheme of RLM 74, except for the top of the tail around the Hakenkreuz. The finish was uneven, giving the impression of two or more low-contrast colours and the machine also had yellow panels under the cowling and wingtips, with the yellow rudder marked with 30 victory bars. The Gruppe badge and Scholz's personal emblem were carried below the cockpit on the port side only. Photo 01-02: FliegeRGuhrer Nord-Ost was substantially reinforced in the Spring of 1942 when III./JG5 transferred from the west coast of Norway and joined II./JG5 in the Petsamo area. III./JG5 was commanded by Hptm. Gunther Scholz who, at that time, had 26 victories and had previously served with 7./JG54 on the Eastern Front. The photograph (Photo 01) shows Hptm. Scholz's Bf 109E-7 in the late Spring or early Summer of 1942 with 30 victory bars marked on the rudder. This 5./JG 5 Bf 109E7 Red 9 flown by Dietrich Weinitschke and based out of Petsamo Feb. 1942 was shot down by Sn.Lt Yeliseyev on Feb 26 1942 but was later rescued by Fi 156. Photo 01: A Bf 109, probably an E-7, showing the shamrock badge of 6./JG5 on the cowling. Photo 01: Seen from left to right on this Bf 109F are the badges of III./JG5 - a Lapp boot superimposed on a white field and blue cross - combined with 8./JG5's emblem of a yellow Edelweiss on a dark brown shield outlined in yellow. The spread-eagle emblem was in red, outlined in white, and is reported to have been in memory of Hptm. Alfred Pomaska who was killed over France in 1940. This marking was apparently applied to a number of 8./JG5 aircraft, although the association with Hptm. Pomaska remains unexplained. Remarks: Veteran of Spain with one victory. Channel pilot. Stfkpt 1/JG-21 in July, 1939. One of the first fighter pilots to receive the EK 2, 17 September, 1939, along with Hans Ekkard Bob. His 1st victory, a Hawk-75A east of Löwen, 13 May, 1940. His 2nd, a Morane 406 W of Peronne on 20 May, 1940. His 5th a Spitfire W of Folkestone on 25 August, 1940. Replaced Hptm. Ultsch 6 September, 1940. In April of 1941, both Werk# 5585 'KB+LX' 'Wh ?' and 1177 'Wh ?' crashed near the Pancevo, (Loc?) 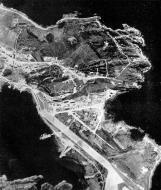 Airfield, flown by Scholz. Pilot disposition and crash circumstances are unknown in either incident. He obviously survived and went on to command JG-5 as of July, 1944. Also served in Poland, France, Battle of Britain and the Soviet Union. His first known Soviet victory, a SB-2 on 23 June, 1941. A double victory on 7 July, 1941; both SB-3's. An I-153 on 19 September, 1941. An I-26 on 11 October, 1941. A Soviet Hurricane on 18 May, 1942, while serving as Kdr of III/JG-5. Another Hurricane at Murmansk on 14 July, 1942. A MiG-1 on 12 August, 1942. Another III/JG-5 victory, a P-40 W of Cape Korabelnyj on 18 August, 1943. Alternate spelling: Schölz. Remarks: KIA 19 February 1942; aerial combat with a MiG-1 over Petrijärvi (Finland), near Loukhi. He was able to make a forced landing at Räetkävaara, but probably froze to death in the Kaldoaivi wilderness. This AC was recovered in 1975, and is now on display in the Central Finland Aviation Museum (H.Honkanen). Andreas Brekken and Rune Rautio believe he may have become a POW. Luftwaffe pilot Asisbiz database list of aerial victories for Gerhard Seibt? Remarks: POW 12th March 1943 after being shot down by a Soviet P-39 at Murmaschi. One known victory, a Soviet P-40E, piloted by Lt A.V.Pshenyov, west of Murmansk on 1 June, 1942. Cousin of Horst Sorbeck of I/JG-4. He was a good friend of Wulf Wodowitz. Magnus, 18 victories. Bowers/Lednicer, 18 victories. Survived the war, residing at Theodor Loos Weg 16, 12353 Berlin. Remarks: POW 3rd January 1944 . His first known victory, a Soviet Hurricane on 25 February, 1943. A 2nd, a P-39 on 23 May, 1943. A 3rd, a Hurricane IIc on 22 June, 1943. Nos 4 & 5, an Il-2 and a Hampden on 4 July, 1943. Four P-39's in the Eina-Guba area on 18 August, 1943. Nos. 10 & 11, two Il-2's SW of Petsamo on 25 November, 1943. Remarks: 437 combat missions, 6 victories in the West plus one PT boat destroyed. His first known victory, a Soviet Hurricane on 9 May, 1942. A 2nd Soviet Hurricane on 15 May, 1942. A 3rd Soviet Hurricane on 28 May, 1942. A P-40 at Schonguy (Murmansk) on 19 July, 1942. A Soviet P-40 on 9 September, 1942. A Soviet P-40 on 31 December, 1942. Two Pe-2's on 23 January, 1943. A Pe-2 on 5 February, 1943. A Soviet Hurricane on 13 March, 1943. A P-39 on 29 April, 1943. A Soviet Hurricane on 22 July, 1943. Three P-39's near Eina-Guba on 18 August, 1943. Two Il-2's and a P-40 on 14 September, 1943. An Il-2 and a P-40 SE of Pon-Jawr See and 20 km W of Murmansk on 25 November, 1943. A Yak-9 on 2 April, 1944. From May 1944 to July 1944, he ran an amazing score of multiple victories, beginning with eight on 16 May, 1944. Two P-40's and two Il-2's on 15 June, 1944. Eight more victories on 17 June, 1944. Six victories on 27 June, 1944. A P-39, a Boston III and two Yak-9's on 17 July, 1944. Seven victories on 23 August, 1944. Deceased 13 October, 1972 at Konstanz. Franz Dörr was born on 10 February 1913 at Mannheim. During 1939-1940, Dörr served as a reconnaisance pilot in Poland and over the Western front. 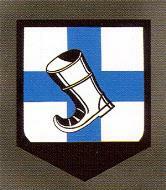 In spring 1941, Feldwebel Dörr was transferred to 1.(Erg. )/JG3, based in Holland. He claimed his first victory on 29 September 1941, when he shot down a RAF Wellington twin-engine bomber. On 1 January 1942, 1.(Erg. )/JG3 was redesignated 7./JG5 and relocated to the Northern front. By the end of 1942, Dörr had raised his victory total to 12. He recorded his 20th victory on 18 August 1943. Dörr was appointed Staffelkapitän of 7./JG5 on 14 September 1943. By the end of 1943, Dörr had increased his victory total to 37. May 1944 was to see Dörr begin an amazing series of victories: six victories on 16 May, four on 25 May, five on 26 May, four on 15 June, eight on 17 June, five on 27 June, seven on 28 June, five on 4 July and four on 17 July. Oberleutnant Dörr was awarded the Ritterkreuz on 19 August for 99 victories. On 1 August 1944, Dörr was appointed Gruppenkommandeur of III./JG5. He claimed six victories on 23 August to record his 100th through 106th victories. In October, Dörr claimed 22 Russian aircraft shot down, including six on 9 October and five on 21 October. Dörr survived the war but died on 13 October 1972 at Konstanz. Franz Dörr was credited with 128 victories in 437 missions. He recorded one victory over the Western front. Included in his victory total are 16 Il-2 Sturmoviks. Remarks: POW 5th August 1942 emergency landing as a result of a fuel shortage. His first known victory, a Soviet Hurricane on 9 May, 1942.